A realty transfer tax increase isn’t the only way Pittsburgh might finance a trust fund for affordable housing. City Council also could reallocate money from a general fund to support the proposed Housing Opportunity Fund, Councilman R. Daniel Lavelle said Wednesday. 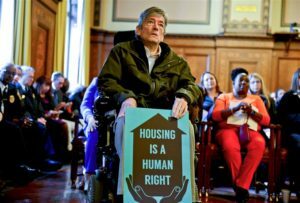 He’s sponsoring legislation to create the program, which eventually would budget $10 million a year in home assistance for low- to moderate-income Pittsburghers. “Ultimately, yes, there probably should be a number of revenue sources,” Mr. Lavelle said. Council is expected to take a preliminary vote next week on establishing the trust fund. Within a month of its final passage, Mr. Lavelle said, he wants council to have a separate proposal “on the table” to pay for the effort. One option — an increase as high as one percentage point in the city’s 4 percent realty transfer tax — has drawn strong reservations among some council members and real estate agents, among other critics. Pittsburgh residents already face the highest realty transfer taxes in Allegheny County, said real estate consultant Michael J. Suley. Half of that goes to the city, with the state and local school district receiving the rest. “I just see this as a deterrent to buying a home in the city,” said Mr. Suley, a city property owner and former manager at the county assessment office. He said a higher transfer tax could discourage would-be homebuyers, increase pressure on the rental market and drive up rent prices. Beyond the general fund, Mr. Lavelle said, council is exploring other options to fuel the proposed program, which would include housing rehabilitation loans, down-payment help and rental assistance. He declined to share much about additional revenue possibilities, calling them preliminary. Still, “I believe all of council ultimately wants to figure out” a funding solution, Mr. Lavelle said. A city task force has identified a shortage of about 17,000 affordable rental units for those earning less than 50 percent of the area median income. I believe, down to my toes, that we should have disproportionate concern” for the underprivileged, said Councilman Ricky Burgess, an advocate of the trust fund idea. He said it’s “the most significant action we can possibly do” to improve the lives of low- to moderate-income women and children. In other business Wednesday, council advanced legislation to study and discourage discrimination against women. Councilwoman Natalia Rudiak introduced the measure, which would form a city Gender Equity Commission. A final vote on the effort could come next week. Ms. Rudiak said the commission, if approved, could have a part-time executive director in 2017. Its budget has yet to be established.